Ladder Cart provides greater mobility, enhanced access, safe ladder handling, and minimal storage requirements. Carries a 6' ladder through standard doorways, down halls, and into elevators. Commercial-grade hybrid construction of powder-coated steel and structural foam holds up to 500 lbs. Tall profile for a more comfortable work height. 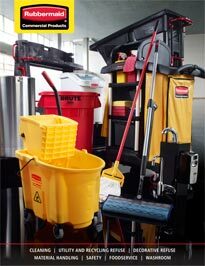 Easily adaptable to work site requirements, including long-item storage, tool holders, and locking cabinets.